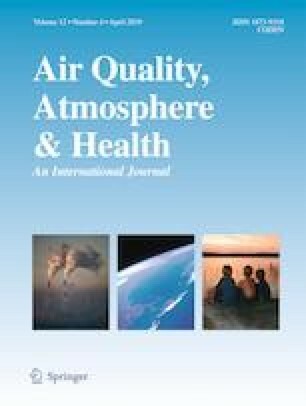 Water-soluble organic nitrogen (WSON) in fine particulate matter (PM2.5) was determined at urban coastal environments in China based on 1-year measurement. The WSON concentrations were in a range of 14.3–257.6 nmol N m−3 and accounted for 22.0–61.2% of the water-soluble nitrogen (WSN) in composition. The average total concentration of free amino acid (FAA) was 1264.5 ± 393.0 pmol m−3, which was lower than those in continental urban cities but nevertheless comparable to the rural area of Pearl River Delta (PRD) in China. The total quantified amines and amino compounds ranged from 223.8 to 806.0 pmol m−3 in which methylamine, ethylamine, and ethanolamine were the most abundant compounds. The average concentration of urea was 7.8 ± 3.0 nmol m−3 and at least one order of magnitude higher than those in marine and rural areas but comparable to other continental cities in China during non-dust period. Summer showed the highest average concentration of WSON (95.0 ± 66.6 nmol N m−3) and composition in WSN (49.3%) compared to other seasons (27.9–37.0%). The results were consistent with previous findings that the inorganics can contribute more than the organics in secondary aerosol formation. There were no distinctive seasonal variations of organic compositions of FAA, amine and amino compounds, and urea. This observation was possibly attributed to a mix of original sources in urban and different prevailing wind directions. Fair correlations (r < 0.4) between WSON compounds and atmospheric oxidants [ozone (O3) and nitrogen oxides (NOx)] suggest that biogenic oxidation is possibly not a major contributing factor in atmospheric coastal urban location. This study was supported under the Research Grants Council of the Hong Kong Special Administrative Region China (Project No. CRF/C5022-14G).